1. Bring a pot of salted water to the boil. Add pasta and set the timer for 1 minute less than the duration recommended on the packet. 2. Stir pasta every few minutes, but meanwhile make your sauce. 3. Gently heat oil in a small saucepan. Add chilli and garlic and fry for a minute or until garlic is starting to go a little brown. Remove from the heat. 4. When the pasta timer rings. 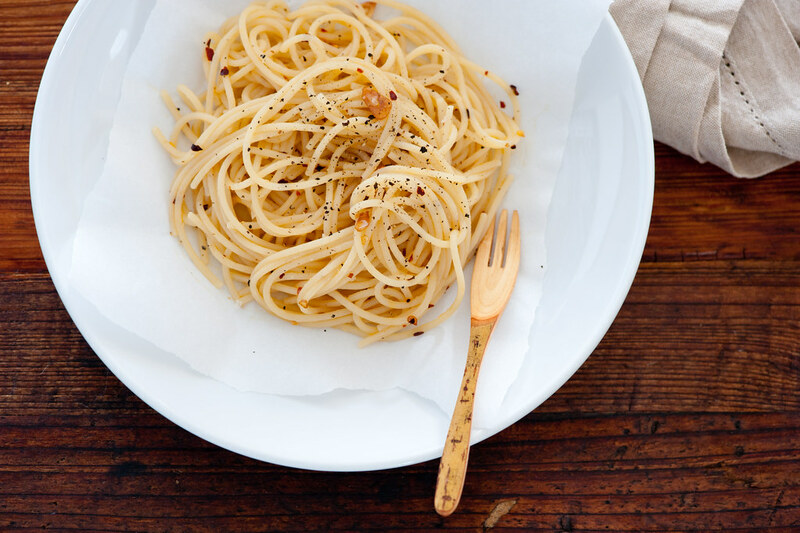 Taste pasta and give it a little longer if it is still too crunchy. When the pasta is al dente, scoop out a cup of cooking liquid and drain. 5. Return pasta to the hot pan and toss in the oil. Taste and season and add a little cooking water if it looks too dry. I like this best freshly made, but you could make up a batch of chilli and garlic oil and keep it on hand. It’s really lovely in all sorts of things. Will keep in the fridge for a week or so. Doesn’t reheat that well. Either microwave or pan fry in a little more oil. carnivore – fry some pancetta or bacon in the oil. Or serve with some finely sliced jamon or proscuitto. lemon & garlic – skip the chilli and proceed as per the recipe, add in the zest of half a lemon at the end and serve with a squeeze of lemon. rosemary – ditch either the chilli, garlic or both and replace with the leaves from a sprig of rosemary. greens – to make it into more of a complete meal, toss in a large handful of washed salad green or rocket (arugula) leaves and finish with a squeeze of lemon. cheesy – serve with freshly grated parmesan if you like, but to be honest I like it better with the simplicity of just the chilli and garlic. gluten-free / slow carb -because this dish is really relying on the quality of the pasta, don’t be tempted to try it with GF pasta. Instead, drain a can of chickpea or white beans and gently fry in the oil with the garlic and chilli. bland – make sure you’re generous with the salt and pepper. too dry – toss in a little reserved pasta cooking water or if you’ve forgotten to fish some out before draining the pasta, just a little more of your best quality extra virgin olive oil instead. pasta gluey or falling apart – this is either overcooking or poor quality drained pasta. Next time reduce the cooking time or use a different brand of pasta. pasta chalky – if the pasta isn’t cooked enough, you get a white chalky centre in the middle of each strand. A little of this is good and is what the Italians call ‘al dente’ or to the tooth. Too much makes for unpleasant eating so next time cook a little longer. bitter flavours – both the chilli and garlic will go bitter if they are overcooked and burnt so be careful not to get the oil too hot or to cook them too long. Makes a very comforting simple supper when the cupboard is bare. For a more complete meal serve with a green salad or some steamed broccoli dressed with lemon juice. I plan to make this with zucchini pasta. I have the neatest spiral cutter (Paderno – available on Amazon) and it makes zucchini spagetti that is really good. I do steam it a bit before I serve it but not much. I havent seen a spiral cutter Miriam… sounds like fun! Another option is to salt the zucchini after you cut it and let it stand for 10-15 minutes. Then rinse and serve raw or you could toss in the pan wiht the hot oil for this recipe to warm it up. The salting softens it enough to make it feel ‘cooked’ without losing any of the heat sensitive vitamins. So funny – this has been my go-to lunch an dinner ever since I was in college! Just love it! Yes its a bit of a classic Anke! I couldn’t agree more Thomas.. This is by far the easiest and best pasta recipe in the world. It’s just a really great example what you can do with only a few good ingredients. I love spaghetti aglio, olio e peperoncino.